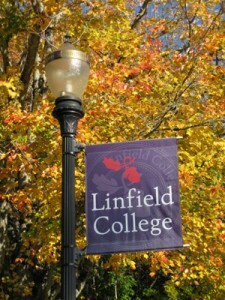 RCC President Bob Musil was the invited Woodrow Wilson Visiting Fellow for a week at Linfield College in McMinnville, Oregon. A historic small liberal arts college in the Oregon wine country, Linfield is a leader in sustainability and, with some 1600 students, prides itself on “the power of a small college.” During his week on campus, Dr. Musil gave a public lecture on “The Legacy of Rachel Carson: Do Environmentalists Really Make a Difference?” Musil told his Linfield audience that Rachel Carson and her colleagues had faced strong opposition from corporate polluters, right-wing politicians, and paid pseudo-scientific attackers. Despite all this, and with breast cancer, Carson persevered, wrote Silent Spring, and brought political change after the anti-environmental fifties. Musil urged students and faculty to do the same and noted much progress today even in difficult political circumstances. During his stay at Linfield, Dr. Musil also was interviewed by the Oregonian and met with classes in biology, environmental science, English, sociology, and philosophy, as well as with President Tom Hellie, and members of his cabinet. Under President Hellie’s leadership, Linfield has signed the American College and University President’s Climate Agreement which commits Linfield to develop climate action plans, promote sustainability across the curriculum, and to move toward renewable energy and zero net carbon emissions. Linfield has already moved strongly to reduce emissions. 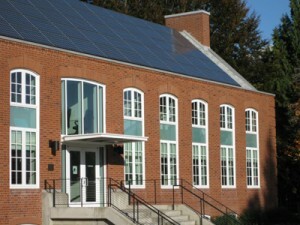 Its former library has been retrofitted and redesigned into T.J. Day Hall a mixed use faculty and classroom LEEDs certified building that features a stunning solar roof array above it classic brick collegiate exterior. Linfield also features frequent bike racks and easy walking on its campus that hosts an organic garden and huge old specimen trees including redwoods, oaks, cedars, pines, and more. 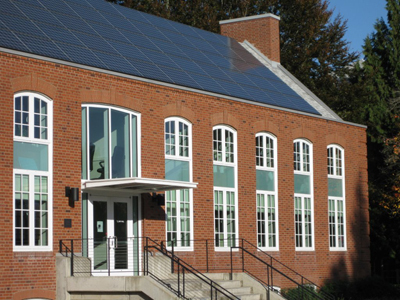 At Linfield, RCC’s Musil also met with the student sustainability group, ACES, and attended a college staff sustainability session led by Linfield Sustainability Coordinator Duncan Reid on green purchasing for various campus offices and departments.